Honestly, Bacci's pizza is a great for GAME DAY. They have huge pizzas that will satisfy anyone's appetite. But besides that, there pizzas just remind me of a huge filler with not much flavor and nothing that is memorable. In fact, cardboard is the first word that comes to my mind whenever I hear someone is ordering bacci's. I will say though I do enjoy it to get full, but wouldn't order it out of the ordinary. 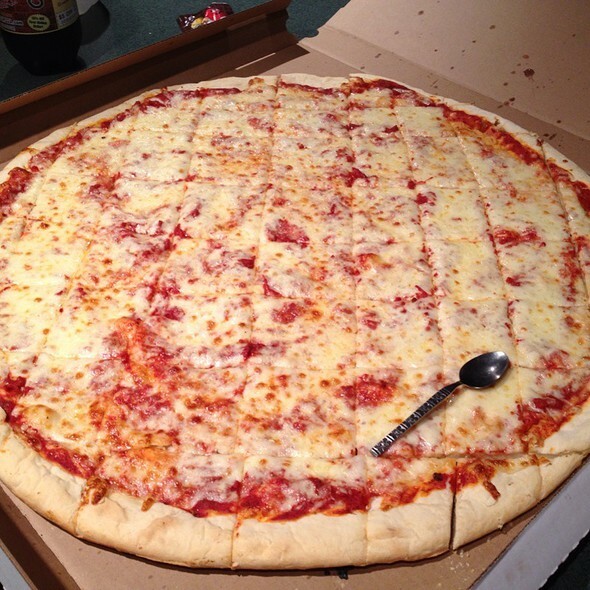 As you can see from the picture, these pizzas are huge (real size spoon)! They will honestly serve a starving family. I think we ordered this 1 pizza for 4 or 5 people and it was plenty. Plenty mainly because of the taste "getting old" after 5 or 6 slices each. Bacci's is known for their huge slices of pizza and these jumbo pizzas but warning you, the crust tastes like cardboard and sometimes it can be really greasy. - Get one of the Jumbo Pizzas for game day. It is always a huge hit with lots of people. - If you decide to pick it up yourself, don't bring a small car. I have a Mazda 6 and the pizza had to go in the trunk with the back seats down. Not that it won't fit in the car... It just won't fit through the doors. Somehow made the mistake twice... the first time it folded over and turned into a GIANT CALZONE.